An earthquake of 7.9 magnitude rocked Nepal on Saturday, April 25, 2015. The earthquake had damaged a lot of structures including the age old Dharahara tower in the center of Kathmandu. The earthquake damaged many temples and caused landslide. Singer and choreographer Shankar BC had escaped a landslide near his shooting location. 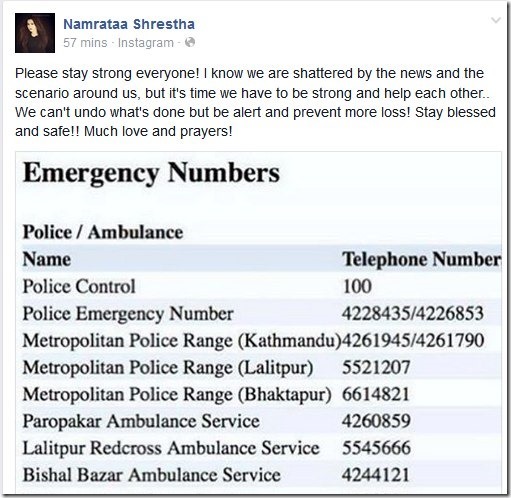 Namrata Shrestha has shared the emergency numbers and asked to stay strong in the adverse time. 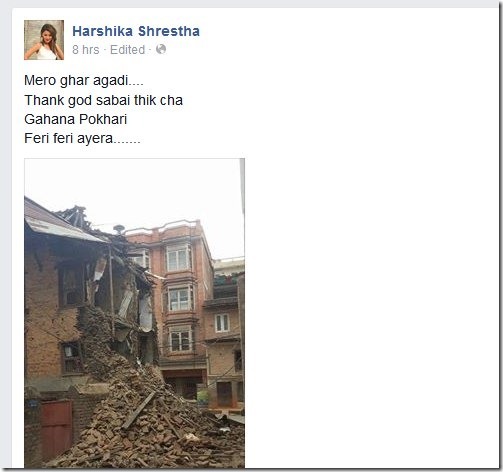 Actress Harshika Shrestha shared a photo of her neighbor’s damaged house and told that hers is safe. 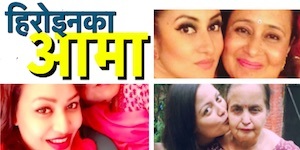 Actress Keki Adhikari has asked to stay safe and "help yourself and help others". Actress Manisha Koirala has also used the destroyed Darahara tower as her profile pictures and informed that her immediate family is fine and is worried about others. 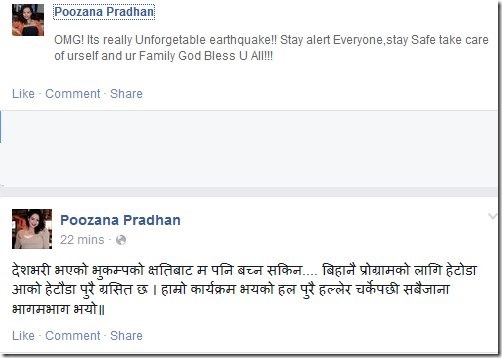 Actress Nandita KC thanked god for her safety and asked everybody to stay safe. 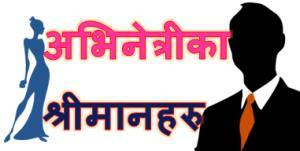 Actress Neeta Dhungana expressed her helplessness and asked god to help. 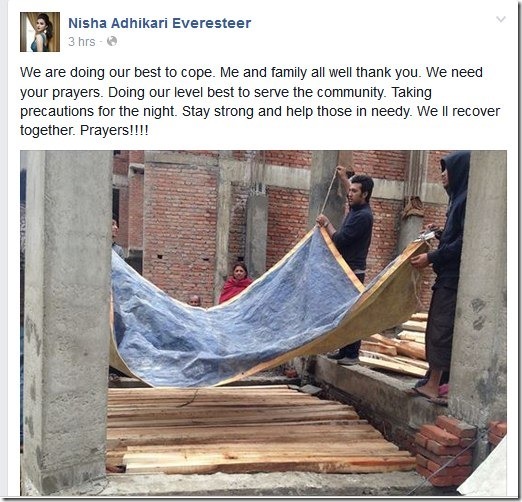 Nisha Adhikari also posted that she is safe and is doing her best to support the community. Poojana Pradhan escaped from the hall she was performing in Hetuda when cracks started to forming after the earthquake. 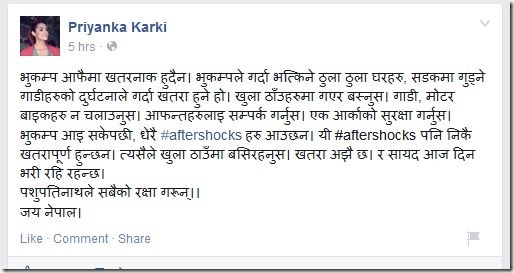 Actress Priyanka Karki has asked everybody to stay outside and stay safe. 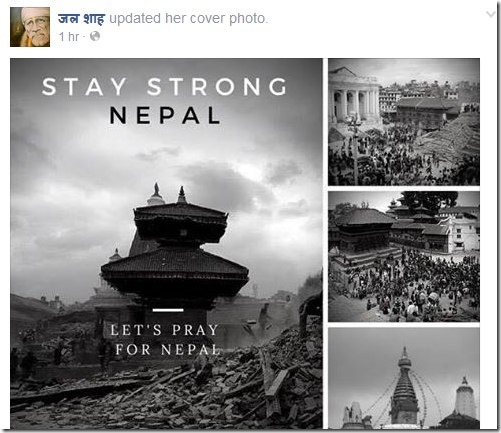 Actress Jal Shah has used the "Stay Strong" and ‘Lets Pray for Nepal’ posters in her Facebook page. 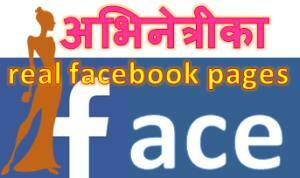 This entry was posted in Gossips, News and tagged Earthquake, Harshika Shrestha, Jal Shah, Keki Adhikari, Manisha Koirala, Namrata Shrestha, Nandita KC, Neeta Dhungana, Nisha Adhikari, Poojana Pradhan, Priyanka Karki, Rajani KC. Bookmark the permalink.